Let it be said: I am from the generation that slayed vampires as opposed to falling in love with them and letting them sparkle (it must be noted that Buffy the Vampire Slayer did produce some enjoyable vampires in Angel and Spike). So there’s that. Now, let’s enjoy Halloween minus the guilt, shame, upset stomachs and sugar comas! 2. Let it Glow! Swap the spider cupcakes and bloody cookie fingers in your gift bags for a G-rated Rave and hand out some glow sticks. 3. Work Your Thang. Build special memories with your kids and show them (and yourself) that play is fun and important for a healthy body. Start the night with a Mini-Monster’s Ball before your dinner. Play the Monster Mash and other fun Halloween tunes and dance your little vampire heart out. After dinner, join the kiddos and walk house-to-house with them while they trick-or-treat. Take turns thinking of different ways to get to the next house… maybe you do the Igor Foot Slide, the Boogie Man Boogie or the Headless Horseman Trot. 4. Bat Wings, Brains and Barf. Doesn’t that menu just scream “Eat Me! 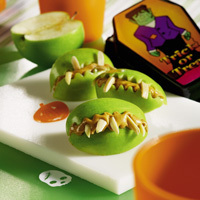 ?” Plan a fun Halloween dinner that will actually excite the kids to sit down and eat a healthy meal before trick-or-treating. Think chicken “bat” wings, scrambled “brains,” carrot “fingers” with almond “fingernails” (stick the slivered almonds on the carrots with a little hummus), or guacamole vomit (bonus points for extra chunky and having it come out of a pumpkin or other figure) with vegetable dippers. 5. Savor Your Sweets with Enjoyment and Pleasure. It is Halloween, have your favorite candy or cookie or dark-chocolate dipped carameled apple and enjoy it in the company of your family or friends. The key is to not just devour it, but savor it. Eat it slowly, taking time to notice all of the flavors, colors, textures and feelings. Make it a game and see who can eat the slowest. The more we enjoy food, the less power it has over us and the better we realize that one actually is enough. 6. Spread the Love. Allow your kids to choose 10 pieces of their favorite bite-size candy (a month supply at two pieces per week). Allow them (and yourself) to have one or two pieces of candy that night. Place the remainder in the freezer, picking one night during the week when they may have two more pieces of candy. This will give all of you something to look forward to and know that you aren’t depriving yourself of your favorite sweet treat. After they choose their candy, bag the rest and donate it or throw it away. Many organizations and dentist offices will collect the candy (and some will pay you for it) and donate it to troops overseas. Go to http://www.halloweencandybuyback.com for a list of participating businesses. Whatever you decide to do this Halloween, laugh often, be safe and enjoy the little moments in life.